Oh Crêpe! Ate so much food today! 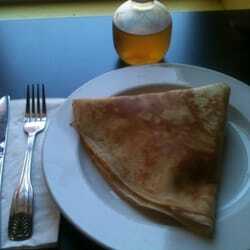 Jst bcuz i'm sorry doesn't mean i didn't enjoy it at the time..
My first #crepe ever. Chocolate and strawberry. excited!! found Nutella and a large spoon n fork on the wall! !